At some point in our lives, we’ve all thought about what we would do if we won the lottery. Buy a house. Pay off some bills. Take a vacation for a month or two. A new car. New clothes. New toys. The list goes on and on. Where did charity fit into that list? Be honest: how many of you have thought about making difference in the world if you came into a sudden windfall of money? Now, imagine you have all the money your heart could desire, could a single child inspire you to donate tens of thousands of dollars and hundreds of hours of your time? That’s the story of the CJWCC. That stands for the C.J. Wilson’s Children’s Charities. While playing in Texas, C.J. Wilson met Micah Champagne, a child with severe hemophilia, at a local children’s hospital. C.J. was there to do some good in the world for the day, but what happened has led him to do some good in the world for a lifetime. This year, I was able to attend the Fifth Annual Throw Strikes Bowling Tournament hosted by the CJWCC. I was not alone. There were over 400 fans in attendance, all bowling to raise over $35,000 for the CJWCC. There were bowling competitions. 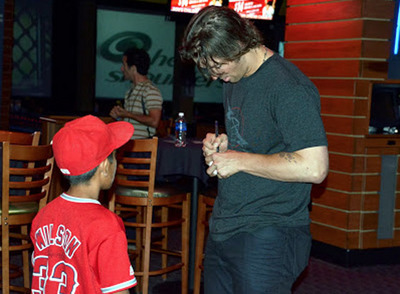 Plenty of Angels gear was raffled off (including a signed Trout jersey and bat). There were booths to learn about local health programs. And, of course, there was C.J. Wilson. In my time, I have attended many charity events. It’s always a pleasure to know that you are doing some good while having some fun. At many of these events, there are wonderful opportunities to meet a celebrity or two. What I saw at the Throw Strikes event, though, was something different. It was the way that C.J. interacted with the crowd. He started to sign autographs at 6:00. He didn’t stop until after 10:00 pm. He never rushed a fan. He never refused to sign an autograph. He took and retook photos for the entire time (with the exception of when he hosted the raffle). He put off eating dinner so as not to delay the crowd. Even while they showed a video about the charity, he continued to talk with fans and continued to sign autographs. More than just signing autographs, C.J. did something that few celebrities can do—he gave each fan a unique moment. That’s hard work. Imagine being in a dark bowling alley and having hundreds of camera flashes go off in your eyes every hour. Add in having to answer thousands of questions, and sign hundreds of items and it has the potential to get tiring fast. And yet, C.J. did all of that without ever letting onto the fans just how taxing all of that can be. He made each person feel special when they spoke with them. He answered their questions, even if they were just asked by the person ahead of them. He interacted with them on their level. He doled out hugs and unique hand shakes. He mixed it up so that no two people got the same experience with him. For the fans, it was truly a once-in-a-lifetime moment. As I watched him working the line (that never seemed to shrink throughout the night), I thought about what I would ask him during an interview. I knew that he would be tired at the end of the night, but I wanted to know what motivated him to be so philanthropic. Was it unique to him, or was it something that was brought out by baseball. Had he thought about what he’d do as he progressed through the Minors, or had it just evolved along the way. I asked him those questions and more in my interview. What I learned was rather unique about C.J. Besides the generous nature of C.J., two other things really stood out for me about the CJWCC. In a video that they shared with everyone, they talked about the types of items that they have donated and supported. And, in some cases, they were sources of entertainment for the children to help them pass the time during their long hospital stays. Having personally experienced a traumatic childhood illness, I knew how much those types of things meant to the children undergoing long-term treatment. Anything that can be done to lift the spirits in the hospital is a godsend. Second, as C.J. Wilson said, “A lot of people ask us how they can help with our charity. You can always donate your time.” I fully agree. While charities need people to write checks (and big checks really help), they live and die on the support of people committing the time and following through with the effort. For many people, donating money is easier than donating time. That’s why I was so impressed with C.J. Wilson because he did both. Not only does he support the charities monetarily, he also supports the charity with his time. He is actively involved in their work and actively supported the fans who came out to attend. What I saw was truly inspired play. Please click below to watch our interview with C.J. Wilson. Please click here to learn more about the CJWCC and how you can help support its worthy cause and attend their upcoming events. Please click here to learn more about C.J. Wilson and all of his endeavors.